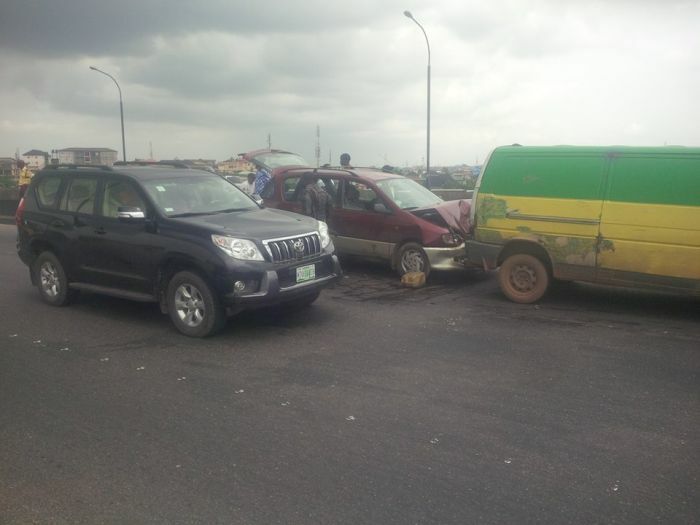 There was traffic gridlock earlier today after an accident occurred on Ogudu bridge in Lagos. According to Austine Umar, one of the victims who was later revealed to be the driver – fell off the bridge after the accident as men of the Rapid Response Squad RRS did all they could to control the situation. The driver of the red mini van after the collision, reportedly came out from his vehicle with a head injury, blood all over his face and suddenly became unconscious as he fell down from the bridge. He was later rescued by people around and taken to the hospital.